A lot of you know me as a very strong and physically fit guy. But I wasn’t always like this. There was a time in my life I was depressed and overweight due to a car accident I experienced 13 years ago. 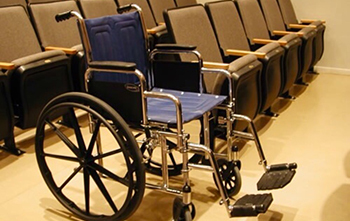 I was injured so severely that I spent a period of time in a wheelchair, with a back injury so bad, a couple of doctors told me that I would be lucky if I ever got to walk normally (without limping) again unless I got a surgery. I declined the surgery and focused on intense physical rehabilitation instead. It took me a year to walk normally and two years to be able to jog again. 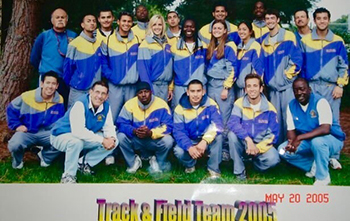 Two years after that (2005) I was competing for college track and field. I recently attended a fitness conference hosted by the number 1 guy in the fitness industry in America, Bedros Keuilian. I attended this conference with the goal of being able to reach more people; to reach and help more people positively change their lives and improve their health. After I told Bedros my story, he asked me if people knew the struggles and physical challenges I experienced as a result of the car accident. I responded that not all of them knew, because for me it has been a private story. Bedros is the one who told me to make this public, because that’s the main reason why I ended up in this industry. People need to know my story. It was spring of 2002 and I had recently moved to the United States from Mexico City for college. I had settled in to my apartment, began taking classes, joined a soccer team, and got a part time job in San Jose, CA. I was starting to become accustomed to my new life when I decided to take a trip home to visit my friends and family for Spring Break. I was back in Mexico City in April and in some ways it felt like I never left. I was welcomed back by my family and friends who I had missed very much, and I went out with my friends to celebrate my return. My life was as perfect as possible in those moments. While leaving the club that night to go home I got in to the backseat of my friend’s Volkswagen Golf (those cars with no trunk). We sat idle in the car for a few moments as we waited for the rest of our friends to join us when suddenly, everything went dark. When I regained consciousness I was in the hospital bed. Later the doctor retold the story of what happened to me. There had been a drunk driver in a Mercedes who had passed out on his steering wheel and left his foot on the accelerator. His car ran straight into ours, crashing in to the back of the Volkswagen Golf at 70 mph. 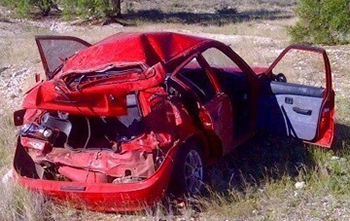 Remember, I was in the backseat, and there was no trunk to reduce the impact I experienced. The police officers who arrived on the scene had to pry me out of the backseat by cutting open the car and rescuing me. The lower half of my body was crushed. The doctors told me the only reason I didn’t become a paraplegic after the accident was because of the strength and size of the muscles in my legs and back. Doctors warned me that I would be lucky if I could ever walk again, and even then I would have a permanent limp. The doctors recommended back surgery to fix (my back) but I declined, as I had heard people who had back surgery were not guaranteed to walk again. I chose to rely instead on my own dedication and resiliency in intense physical therapy rehabilitation, hoping that my dedication would pay off and I would have the chance to recuperate the life I was living before that fateful night. The news I received after the car accident sent me in to a depression for a few weeks. I had always been so active and fit, playing soccer and boxing and especially, running, my favorite activity of all. Laying in a hospital bed, thousands of miles from my new home and life in the United States, I couldn’t help but focus on what I had lost in a matter of seconds. My situation felt dire. After being released from the hospital I was faced with a decision. I had to decide between giving up on my dreams of college in the U.S. and staying in Mexico, or move back to the U.S. immediately to continue school and take my chances with my recovery, as I had already missed some school and couldn’t afford to miss more. Despite the physical limitations I was now dealing with as a result of the accident, I had a moment of clarity in which I decided I would not let this horrible event define the rest of my life. I decided in that moment that not only would I walk again, but I would do anything it took to run again. I left Mexico two weeks after the accident in a wheel chair, headed back to San Jose. 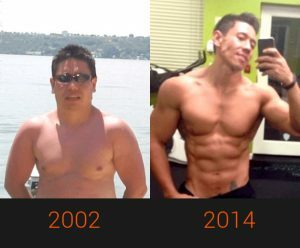 I knew I had a long road in front of me but I believed in myself to overcome what I was experiencing, especially because exercise was such an important aspect of my life. I spent the first year back in San Jose attending intense physical therapy rehabilitation, learning everything I could about my injury and what solutions existed to help relieve the pain in my back. I continued with my life as much as I could, attending class and my part time job while also focusing on my recovery. It was a year before I could walk again, and as promised by my doctors, with a limp for the first 9 months or so. It would be two years of intense recovery before I could walk normally again, and jog lightly. Four years after the accident I was as fully recovered as possible, and I was able to compete in my college’s track and field team, running the 100 meters in 11 seconds. Living with so much pain from an injury was a life changing experience, not only physically but mentally because I suffered in my own personal identity. Not only was I dealing with pain, but I was suffering the discrimination of society toward a handicap person. It was after the first year of my rehabilitation I knew that I wanted to spend my life helping others recover from injuries and pain, so they too could return to their lives as they knew them before the pain. I’m telling you this because besides being fit, and getting the benefits of living a healthy lifestyle, I am in the health industry due to the gratitude I have for recovering from injury and the desire to help others feel the same. Despite having gone to San Jose State University for Business Administration, I chose to follow my heart in to the fitness industry. My number one reason for making this my career is my desire to help people relieve the pain of injuries they experience and return them to a life of physical activity, extending their longevity and quality of life. Whereas all of my certifications, credentials and experience allow me to train all people regardless of age, gender or ability, my specialty is women between the ages of 30-50 years old who struggle mainly with weight loss after pregnancy, lower back injuries and knee injuries. As I have personally experienced back, knee, shoulder and neck injuries (among others) and recovered from most without surgery, I am a true believer in healing the body through consistent physical rehabilitation.